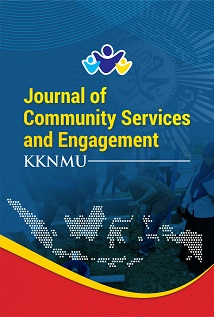 Universitas Muhammadiyah Surakarta (UMS) Online Journals is the online journal portal managed by the Faculties, Departments, Research Centers, and other Units in the UMS campus. As a center of education and research, UMS is committed to boost the quality and quantity of scientific articles in Indonesia through an online journal system facilities for the academic community in which UMS will publish and manage Periodicals Scientific Journals. This commitment is also part of UMS support for the policy of Higher Education in Indonesia to increase the number of scientific publications. Submit your manuscripts today! (in English) through our online system. The authors should refer to the JEP: KMEP Author Guidelines in writing the manuscript. The authors are also encouraged to use Mendeley Citation Manager or Zotero in writing the manuscript. Submitted papers are evaluated by anonymous referees for contribution, originality, relevance, and presentation. The Editor shall inform you of the results of the review as soon as possible, hopefully in 12 weeks. Khazanah Informatika: Jurnal Ilmiah Komputer dan Informatika, an Indonesian national journal, publishes high quality research papers in the broad field of Informatics and Computer Science, which encompasses software engineering, information system development, computer systems, computer network, algorithms and computation, and social impact of information and telecommunication technology. Khazanah Informatika is accredited by Indonesian Ministry of Research and Higher Education at Sinta S2 level, according to Decree of Direktorat Penguatan Riset dan Pengembangan SK Nomor 21/E/KPT/2018 which is valid since 9 July 2018 for 5 years. 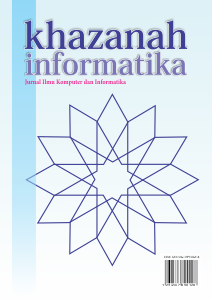 Khazanah Informatika is published by Muhammadiyah University Press (MUP), Universitas Muhammadiyah Surakarta. Khazanah Informatika has Sinta S2 score, or is accredited B by Indonesian National Journal Accreditation board. Prospective authors should consult the author guidelines prior to submitting their works. All submissions are double blind reviewed by peer reviewers. Riset Akuntansi dan Keuangan Indonesia issued by the Program Studi Akuntansi, Fakultas Ekonomi dan Bisnis, Universitas Muhammadiyah Surakarta. Riset Akuntansi dan Keuangan Indonesia is published twice a year in April and September. Riset Akuntansi dan Keuangan Indonesia is a medium of communication for the scientific work is mainly related to the field of study of accounting and finance. Visit also our colleague Journal of Accounting and Investment (Accredited Ranking 2) and Jurnal Reviu Akuntansi dan Keuangan (Accredited Ranking 3). Jurnal Ilmiah Teknik Industri is a scientific journal that aims to participate in developing the scientific field of Industrial Engineering, contains the results of research and theoretical study from lecturers, researchers and industry practitioners. 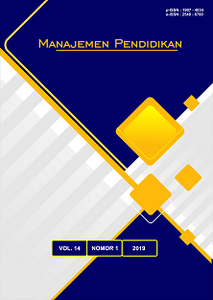 Jurnal Ilmiah Teknik Industri is administered by the Department of Industrial Engineering, Faculty of Engineering, Universitas Muhammadiyah Surakarta and published by the Muhammadiyah University Press (MUP). Jurnal Ilmiah Teknik Industri published twice a year, in June and December. Editors receive scientific articles or papers containing the results of research, literature review, or review activity that is closely related to the field of Industrial Engineering. Jurnal Ilmiah Teknik Industri accredited by The Directorate General of Research and Development Strengthening, The Ministry of Research, Technology, & Higher Education, with its decree: No. 21/E/KPT/2018, at Sinta S2 level. The accreditation certificate can be seen here. 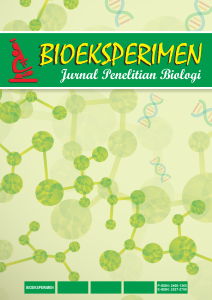 Bioeksperimen: Jurnal Penelitian Biologi is a scientific journal Biology Education Department, Faculty Of Teacher Training and Education Universitas Muhammadiyah Surakarta, which focuses on the delivery of information on the results of scientific research conducted by the internal and external academicians UMS especially in the field of Biology. Bioeksperimen is published two times a year in every March and September. For the requirements for posts/articles can be published in the Journal Bioesperimen then every author is expected to be able to comply with the rules of writing that has been set by the Editorial Board of the Journal Bioeksperimen. Editorial Board reserves the right to change the editorial and systematic writing without changing the substance of the text. 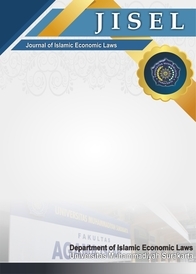 Journal of Islamic Economic Laws, managed by the Department of Islamic Economics Laws, Faculty of Islamic Studies Universitas Muhammadiyah Surakarta has the perspectives of Islamic economic . This journal also has programs aimed at bridging the gap between the practical and theoritical approaches to Islamic Economic Law Studies. This journal invites the intersection of several disciplines, researchers, scholars to contribute knowledge in developing islamic economic literatures. This journal is available online using open journal system which make reader easy to get the published article. This journal also has been indexed by Google Scholar , BASE, and Garuda. 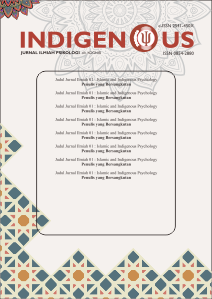 Indigenous: Jurnal Ilmiah Psikologi is a media for Psychology and other related disciplines which focus on the finding of indigenous research in Indonesia. Prospective authors should consult the author guidelines or the provided template (click to download!) prior to submitting their works. All submissions are double blind reviewed by peer reviewers. 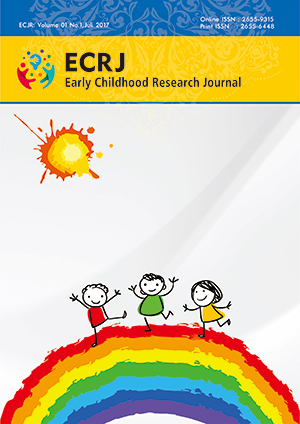 Early Childhood Research Journal (ECRJ) is a scientific journal of early childhood education program of Teaching and Education Faculty of Universitas Muhammadiyah Surakarta focusing on publication of scientific research result conducted by UMS's internal and external academicians, especially in early childhood education. Early childhood research journal (ECRJ) publishes scientific articles in the field of pure and applied science about early childhood education including innovative and creative learning and teaching on early childhood education, detection of growth and development for early childhood, early childhood studies about nutrition and health. The article based on research article, a critical, and comprehensive scientific study of the important and current issues covered by the journal Early childhood research journal (ECRJ). 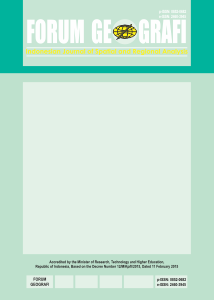 Indonesian Journal on Learning and Advanced Education (IJOLAE) welcomes research articles from academics, educators, teachers, trainers and other practitioners on all aspects of education and learning. The aim of this journal is to promote creativity and innovation in education among scholars or lecturers from Indonesian and international education institutions. The accepted articles are from research or book review in the field of language and literature education, social science education, natural science education, primary education, technology education, geography education, physical education and sport education with the specialization in advanced method, media, and learning which promotes fun education. Komuniti: Jurnal Komunikasi dan Teknologi Informasi is a scientific journal that publishes scientific research papers/articles or reviews in the field of Communication and Media. The scope of this journal includes communication as social science, mass communication, technology communication, communication and networking, media and communication. 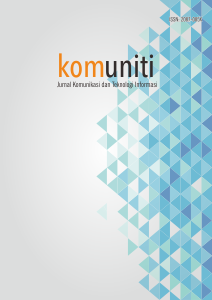 Komuniti is published by Muhammadiyah University Press (MUP), Universitas Muhammadiyah Surakarta. JRAMathEdu (Journal of Research and Advances in Mathematics Education) is open-access and peer-reviewed scholarly online journal managed by Department of Mathematics Education, Universitas Muhammadiyah Surakarta and published by Muhammadiyah University Press (MUP). The journal is published twice a year in January and July. JRAMathEdu is designed and devoted to publish high scientific value research papers of lecturers, researchers, university students (graduate or undergraduate), and teachers in mathematics education area. The journal publishes research papers in the fields of learning mathematics, instructional method in mathematics, innovations in teaching mathematics, evaluation and assesment in mathematics learning, developing technology in mathematics education, developing and evaluation of mathematics curriculum, mathematics and culture, psychology in mathematics education, and other issues in mathematics education area that have a global perspective than local interest. The articles should be original, unpublished, and not in consideration for publication elsewhere at the time of submission to the JRAMathEdu. The author has to ensure that the article submitted has been prepared using the template and following the Guideline for Author. Each article will be checked using Turnitin to ensure the originality (plagiarism check). 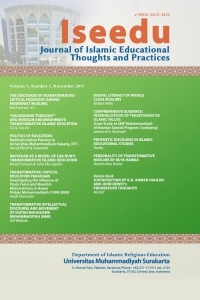 Iseedu: Journal of Islamic Educational Thoughts and Practices is to challenge exellence in professional education by promoting forward-research-finding scholar, progressive and innovative, to bridge the gap between education and professional practice to inspire and challenge tomorrow’s professional clinicians in supportive Islamic learning environment. Manuscripts must be original and shown to be academically interesting to an international and/or national audience. For Iseedu goal is to promote the Islamic educational thoughts and practices by publishing relevant peer-reviewed islamic educational studies. 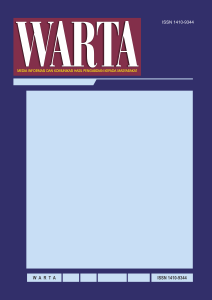 Any visitor to this site can browse the abstracts, read the contents and download the PDF files. You need to be a registered user and log in to upload your manuscript. Registration is free and your contact information will only be used to inform you when a new issue is published. 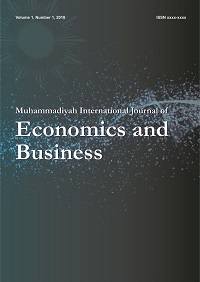 Muhammadiyah International Journal of Economics and Business is a scientific journal managed by the Association of Economics and Business Faculties in Muhammadiyah Higher Institutions. The journal focuses its attention on a wide range of topics including management, accounting, and economics. The published papers are research, reviews, or scientific discussion concerning contemporary issues on the related topics. Warta LPM merupakan media komunikasi dan informasi ilmiah hasil pengabdian kepada masyarakat yang meliputi bidang ilmu-ilmu sosial, sains dan teknologi. 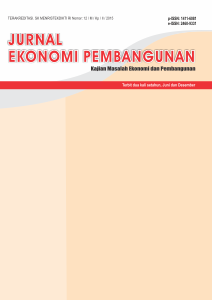 Benefit: Jurnal Manajemen dan Bisnis is a scientific journal that contains the results of theoretical research and studies on economic and development issues. Profetika: Jurnal Studi Islam fokus pada Kajian Keislaman: Pemikiran Islam, Pendidikan Islam, Hukum Islam, Ekonomi Islam, dan Sosial-Politik Islam. 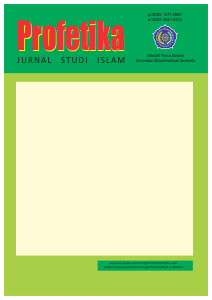 Jurnal Jurisprudence is an academic journal published twice a year by the Magister Law Program of Universitas Muhammadiyah Surakarta. 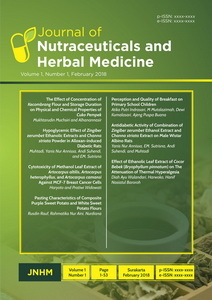 This journal was first published in 2004. 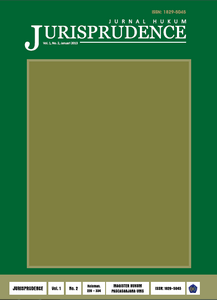 The journal, intended as a communication, information, and development medium of law focuses its content on the results of studies in the field of law, conducted through a variety of known paradigmatic perspectives. 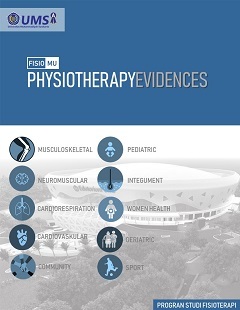 In addition, to carry out its function as an opening bridge with other parties within the wider community, the journal openly accepts the contributions of writings from experts from other disciplines who take the object of law studies..
FISIO MU: Physiotheraphy Evidences is a scientific journal that contains the results of theoretical research and studies on physiotherapy issues. Managed by Department of Physiotherapy, Faculty of Health Science Universitas Muhammadiyah Surakarta. 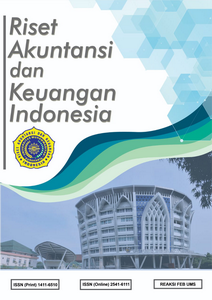 Published by Muhammadiyah University Press.